Janks Archive is an ongoing investigation of insult humor from cultures around the world. Insults are an ancient oral tradition embedded within the collective consciousness of a culture or region with inherent ties to human social evolution. While the intention appears, at first, to be antagonistic, “janks” are in fact an integral aspect of human interaction, used as much to establish dominance as to strengthen camaraderie. This project documents this tradition through crowdsourcing and field recording. We host public collection events in international locations in which we film participants reciting janks from memory and gather contextual information in an attempt to trace origins. Collected material is organized by geographic location and keyword tags, grouping janks by subject matter. In addition to our online archive, we present the collection through public events & exhibitions, installations & publications, and a podcast! 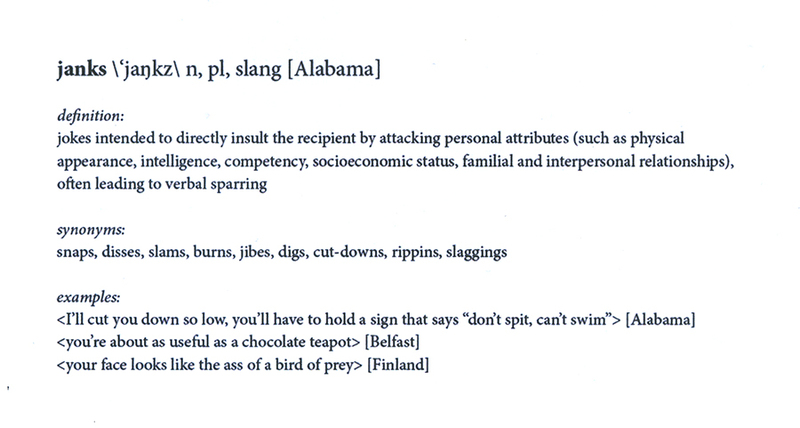 We also keep a blog of our ongoing research into traditions of insult humor throughout the world. Janks Archive was founded in 2012 by Jerstin Crosby, Ben Kinsley, and Jessica Langley.